Enabling and disabling socio-political thinking and decisions impact on resources for caring about intellectual impairment and can create two things: policy environments in which enabling services will be delivered and spaces that will include or exclude the participation of people with intellectual impairment as active citizens. 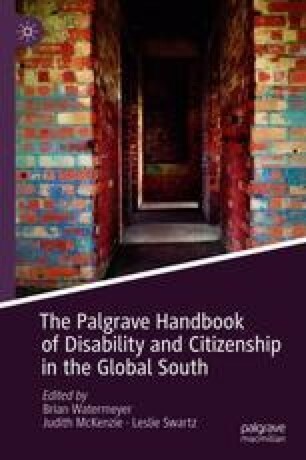 To achieve citizenship with the rights and obligations this entails, we all require socio-political resources; but how often have we asked people with intellectual impairment what they need in order to live as full members of society? Intellectual impairment citizenship begins with respect for specific requests and needs, effective engagement with individual experiences and opinions, and recognition of a truer knowledge and expertise. Including intellectually impaired individuals as experts in research and policy formulation increases the likelihood that policies will more accurately reflect their social conditions and have greater impact on their daily lives. It remains our task to facilitate conditions and opportunities in which expert voices on intellectual impairment can be raised. In relational and intersubjective socio-political and research spaces, experiences of impairment are no longer bestowed upon but voiced by people who live with intellectual impairment in a disabling world—in other words, the real experts. Capri, C., & Buckle, C. (2014). ‘We have to be satisfied with the scraps’: South African nurses’ experiences of care on adult psychiatric intellectual disability inpatient wards. Journal of Applied Research in Intellectual Disabilities. Advance online publication. https://doi.org/10.1111/jar.12118. Hartley, W. (2013, September 16). IEC rejects suggestions that mentally impaired be allowed to vote. Business Day. Retrieved from https://www.businesslive.co.za/bd/national/2013-09-16-iec-rejects-suggestions-that-mentally-impaired-be-allowed-to-vote/. Accessed 24 Oct 2014. Health Professions Council of South Africa (HPCSA). (2006). Professional board for psychology rules of conduct pertaining specifically to psychology – Form 223: Annexure 12. In health professions council of South Africa, health professions act, 1974 (Act no. 56 of 1974) Ethical rules of conduct for practitioners registered under the health professions act, 1974. Retrieved from http://www.hpcsa.co.za/downloads/conduct_ethics/rules/Ethical_rules_psychology.pdf. Accessed 6 May 2017. London, L., Kagee, A., Moodley, K., & Swartz, L. (2011). Ethics, human rights and HIV vaccine trials in low-income settings. Journal of Medical Ethics, 1–8. Online publication. https://doi.org/10.1136/medethics-2011-100227. Ndenze, B. (2013, September 24). Prisoners will vote in 2014 elections. IOL News. Retrieved from http://www.iol.co.za/news/crime-courts/prisoners-will-vote-in-2014-elections-1578772. Accessed 24 Oct 2014. Republic of South Africa. (1996). Constitution of the Republic of South Africa No. 108 of 1996: Chapter 2 – Bill of Rights, 7–39. Retrieved from http://www.gov.za/sites/www.gov.za/files/images/a108-96.pdf. Accessed 6 May 2017. Republic of South Africa. (1998). Electoral act 73 of 1998. Retrieved from http://www.polity.org.za/article/electoral-act-no-73-of-1998-1998-01-01. Accessed 24 May 2014. Republic of South Africa. (2013). National mental health policy framework and strategic plan, 2013–2020. Retrieved from https://www.health-e.org.za/wp-content/uploads/2014/10/National-Mental-Health-Policy-Framework-and-Strategic-Plan-2013-2020.pdf. Accessed 16 Nov 2014. South African Federation for Mental Health (SAFMH). (2014, May 8). Fighting for the right to vote, 8. Retrieved from http://safmh.org.za/index.php/news/item/82-fighting-for-the-right-to-vote. Accessed 6 May 2017. Stop Ableism. (2017). What is ableism? Retrieved from http://www.stopableism.org/what.asp. Accessed 6 May 2017. Tomlinson, M., Yasamy, M. T., Emerson, E., Officer, A., Richler, D., & Saxena, S. (2014). Setting global research priorities for developmental disabilities, including intellectual disabilities and autism. Journal of Intellectual Disability Research. Advance online publication. https://doi.org/10.1111/jir.12106. World Health Organization. (1997). WHOQOL measuring quality of life. Retrieved from http://www.who.int/mental_health/media/68.pdf. Accessed 4 May 2017. Xingwana, L. (2011). Roundtable two: Ensuring effective and full participation in political and public life (Article 29). Retrieved from https://www.scribd.com/documcent/65157320/Cosp4-Statement-South-Africa. Accessed 6 May 2017.